For this work, the word "telescopic" refers not to seeing great distances, but to the physical unfolding characteristic of antique refracting telescopes. 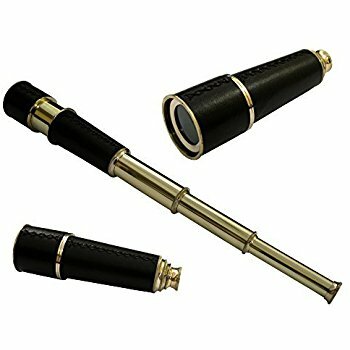 Constructed out of a series of concentric tubular sections, these telescopes, and certainly many other common objects today like radio antennae and umbrellas, are able to expand from a condensed form into a much larger form with minimal effort. Likewise, this work is a set of variations that begins small and contained and gradually expands, step by step, into a much larger musical statement towards the conclusion. Opening with clashing tritones, imposing trills, and brash string glissandi, the theme is not apparent at the onset, but gradually emerges as the dense texture clears. The theme is lyrical and a bit mournful, dwelling in a minor diatonic mode. The first three variations are set for each instrument of the trio playing unaccompanied, first the cello, second violin, and third piano. The violin and cello variations are both aggressive and rhythmic, utilizing the full ranges of the instruments through virtuosic acrobatics. To contrast this explosion, the piano's solo variation is subdued and atmospheric, concentrating on trills and fluidity. After the solo piano finishes, there are three variations for duos. The fourth variation is for violin and piano, a soaring aria for the violin, singing over the piano's incessant statement of the harmonic series over the lowest C. The fifth variation is for violin and cello alone, and the aggressive nature of the first two variations returns as they spin a highly rhythmic and syncopated two-voice fugue. The sixth variation continues the rhythmic energy between the cello and piano, with constant 16th notes running over shifting rhythmic impulses. After the tension evaporates, the final seventh variation begins for the whole trio with delicately repeated chords in the piano. Structured as a passacaglia, the violin and cello play long melodies that gradually rise higher and higher, soaring over growing tension in the repeated chords. Finally, when this tension is reaching its breaking point, the clashing trills and glissandi from the opening of the work returns, and leads to one final, distant statement of the theme by the muted cello. Telescopic Variations is currently self-published. You may purchase this work with the buttons below. If you need a quote for a purchase order, please contact me.